If you've read this blog long enough (or if you know me personally), you'll know that I'm a lifelong obsessive Beatles fan. Their self-titled album from November 1968, more commonly called the White Album, is not only my favorite album of theirs but my favorite album of all time. I have both the stereo and mono mixes of the album and have never been able to get enough of it. Besides the two mixes of the album, there are two essential bootleg CDs I've had that contain additional material from these sessions. One is the Peter Sellers Tape (a tape of early/different mixes Ringo made as a gift for his friend Peter Sellers) and the other is the Esher Demos. In February 1968 the Beatles went to Rishikesh in India to study transcendental meditation with Maharishi Mahesh Yogi. Ringo Starr and his wife were the first to return to England in late February, followed a couple of weeks later by Paul McCartney and Jane Asher. John Lennon, George Harrison, and their wives stayed until early April when they left after alleging the Maharishi of improper behavior toward one of the female attendees. During the time they were India the band had acoustic guitars and wrote a large number of songs. Once they all were back in London, they regrouped at George Harrison's house Kinfauns in Esher to record demos of the twenty-seven new songs they'd written between Lennon, McCartney, and Harrison. Using nothing but acoustic guitars, bongos, rudimentary percussion, and their voices they put these songs down on tape and used them as a starting point for their next album which became the White Album. For years I've had a bootleg CD that contained twenty-four of the twenty-seven demos in so-so sound quality. Then in 1996 the Beatles released seven of the demos on Anthology 3 with pristine sound. That was a revelation as it told Beatles fans that the band had the master tape and that the complete demos existed in great sound quality. However, for years I and every other Beatles fan pined to hear all twenty-seven demos with that great sound, but as the years wore on it seemed we were waiting for something we'd never get. 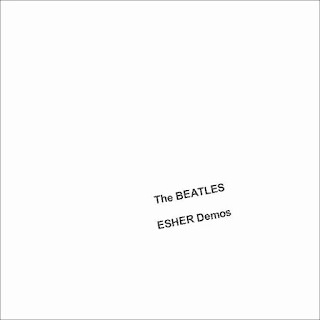 I'm happy to say that the long wait was finally rewarded because the Beatles have just released the complete Esher Demos as part of the 50th anniversary release of the White Album. Now we have all twenty-seven demos in flawless sound quality. Every White Album song that was written in India was demoed along with some that didn't make the cut. Of the songs demoed that didn't make the album, some were recorded during the White Album sessions but left off of the album ("Not Guilty," "What's the New Mary Jane? "), some weren't released until their Abbey Road album in 1969 ("Mean Mr. Mustard," "Polythene Pam"), some didn't see release until they showed up on solo albums after the Beatles split in 1970 (McCartney's "Junk," Lennon's "Child of Nature" which he rewrote the lyrics to and released as "Jealous Guy," and Harrison's "Circles"), and one was given away to Jackie Lomax ("Sour Milk Sea," which is the greatest lost Beatles track ever...Lomax' version featured a backing band of Harrison, McCartney, Starr, Eric Clapton, and Nicky Hopkins!). In addition, the White Album tracks we all know and love sound great in an acoustic setting. Some like "Blackbird" are very similar to the finished acoustic versions (although still beautiful) while the tracks that eventually became heavier and electric on the finished album have a completely different (though no less intense or emotional) feeling. What the entire disc shows beyond a doubt is the pure magic and genius of the Beatles. Stripped of any studio enhancements and amplification, this was just four guys sitting around a couple of microphones strumming acoustic guitars and singing and yet they still sounded fantastic. Truly gifted musicians sound great whether they're turned up to eleven or they're playing quietly in their living room and as the Esher Demos show, the Beatles were amongst the most gifted musicians and songwriters of all time. And of course any musician is only as good as the songs they write and the Beatles didn't just write great songs, they wrote timeless classics. I can't remember being as thrilled and satisfied with a release as much as I am with this one. In essence this is a completely different version of the White Album and any world where there's more than one White Album is a world I'm happy to live in. "Circles" did see a solo release, the closing track of '82's "Gone Troppo".